Formed in Ottawa in 1993, the Wooden Stars are Michael Feuerstack, Andrew McCormack, Josh Latour and Julien Beillard. They have released four albums of their own, and received a Juno award in 2000 for their collaboration with singer Julie Doiron. Mike has also made a number of widely acclaimed solo albums under the name "Snailhouse". 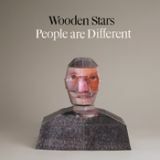 The Wooden Stars’ music is a surprisingly natural fusion of unlikely influences, from XTC and the Clash to Georges Brassens and James Blood Ulmer. Setting strong, plaintive melodies against hints of the jarring dissonance and abstraction into which the songs occasionally collapse, the band has gradually attracted a loyal fan base that includes some of Canada’s finest musicians: the Rheostatics, Change of Heart, Kepler, the Arcade Fire, Julie Doiron, Mike O’Neill, Papaduc Aboubakhar and Hawksley Workman. People Are Different, their new studio album, will be the band's first release in almost eight years.